When it comes to teaching close reading and annotation, is there anything worse than seeing your students mindlessly highlighting for pages and pages with no real understanding of what they’re highlighting or why they’re highlighting it? The frustrating part is that highlighting indicates that they’re trying, but it often shows that they don’t understand why. What complicates this further is that close reading is a skill, not a strategy. Maybe some students just get it and others don’t. This makes it really challenging to teach. In order to serve all of our students, we can’t just stop there. 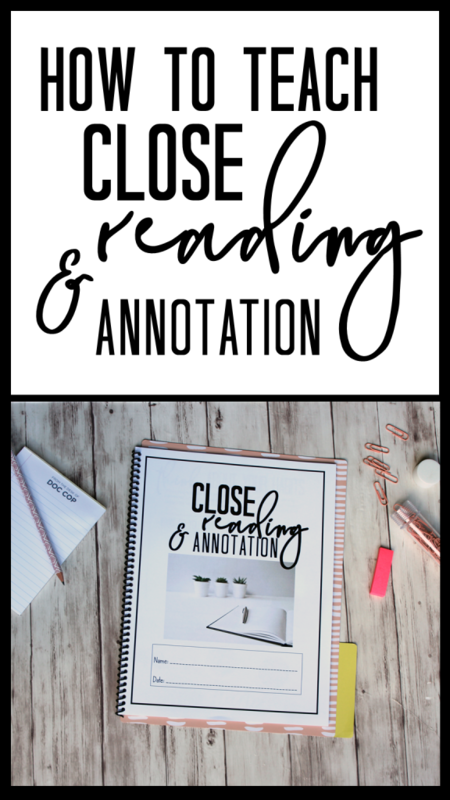 Close reading is a skill that is vital for on-demand writing, high-stakes testing, and real-world reading. 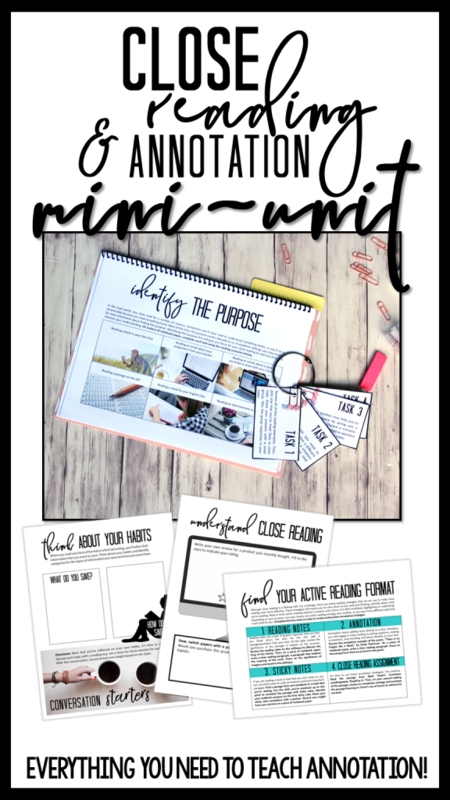 After years of developing this skill while I wrote my dissertation, I created a close reading and annotation mini-unit designed to make teaching close reading and annotation effective and straightforward. Today, I’m sharing my five-step guide that will help you teach your students to be skilled close readers, not mindless highlighters. My professor’s question helped me reflect on my habits. When I did, I realized that I had natural close reading skills and habits. For example, when I was a reading a book that I loved, I would slow down and re-read a paragraph that I loved. Then, I would put a sticky note on that page so I could find it again. Your students likely have a lot of similar experiences in their everyday lives without even realizing it. With the convenience of technology, students are experts at close reading snippets of information from the internet and saving them for later. My students reported that they pin blog posts on Pinterest, save pictures on Instagram, re-Tweet Tweets on Twitter, screenshot text messages, copy and paste quotes into their notes app, archive emails from their teachers, and much more. When students tap into their existing close reading habits, they can examine the underlying purpose. 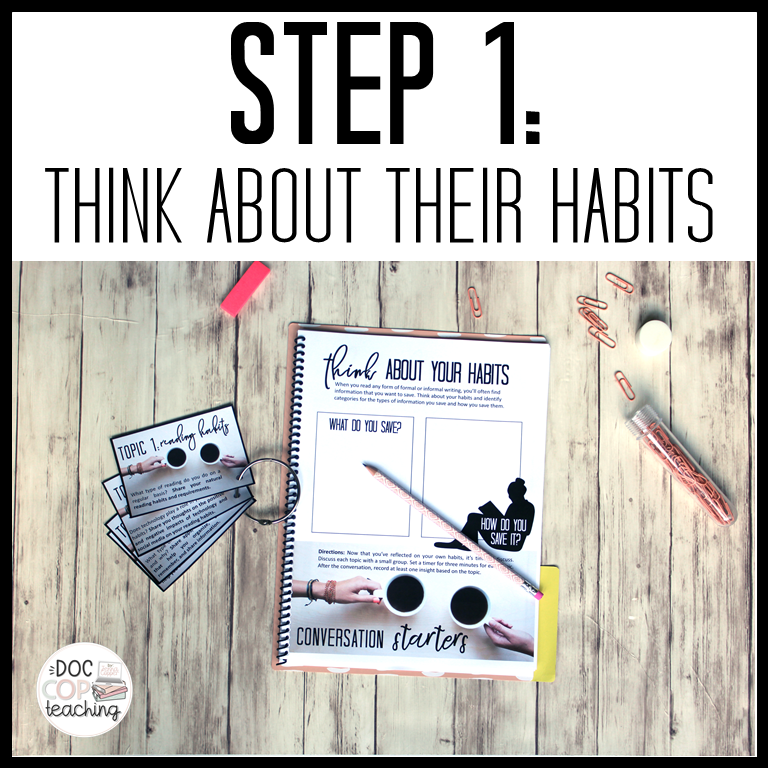 The fun part about this step is that you can go from reflection (in the first step) to practice. 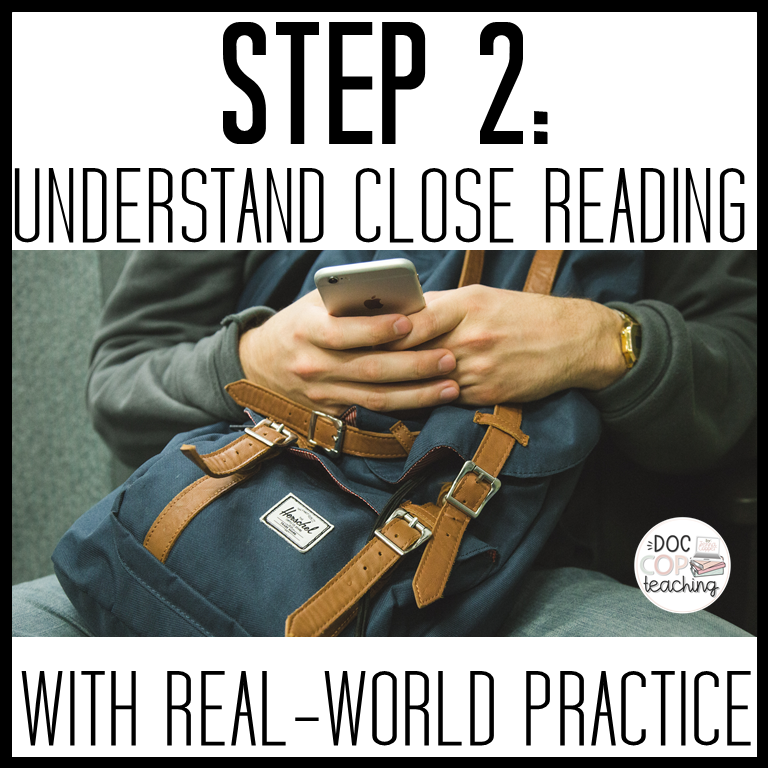 There are so many options to engage students in real-world close reading. You could ask them to find a four-star or one-star restaurant review, read a high-interest article, or share a funny meme. I like to ask students to write product reviews and then close read each other’s to determine if they would purchase the product. Students report some great close reading skills through this practice: reading slowly, questioning the text, re-reading, looking up challenging words, and taking notes. Now that your students have realized what close reading is and how they do it naturally, it’s time for them to apply those skills to academic purposes. In real life, we close read to understand or remember something better. This purpose usually isn’t too far off for academic reading, but it’s far too broad. That idea is what lead me to highlight mindlessly as a high schooler. Instead, we can teach students to give their reading focus by close reading for a specific purpose. For example, when students read a poem, we can ask them to read it paying close attention (aka close reading) to the imagery. Perhaps another poem might include an extended metaphor, so you ask them to key in on comparisons. In a longer work, like a novel, we can ask students to pay close attention to a specific theme. My students did a great job with reverse purpose practice, starting with a scenario and then coming up with a specific purpose. They came up with some great writing prompts and questions related to reading scenarios in school. 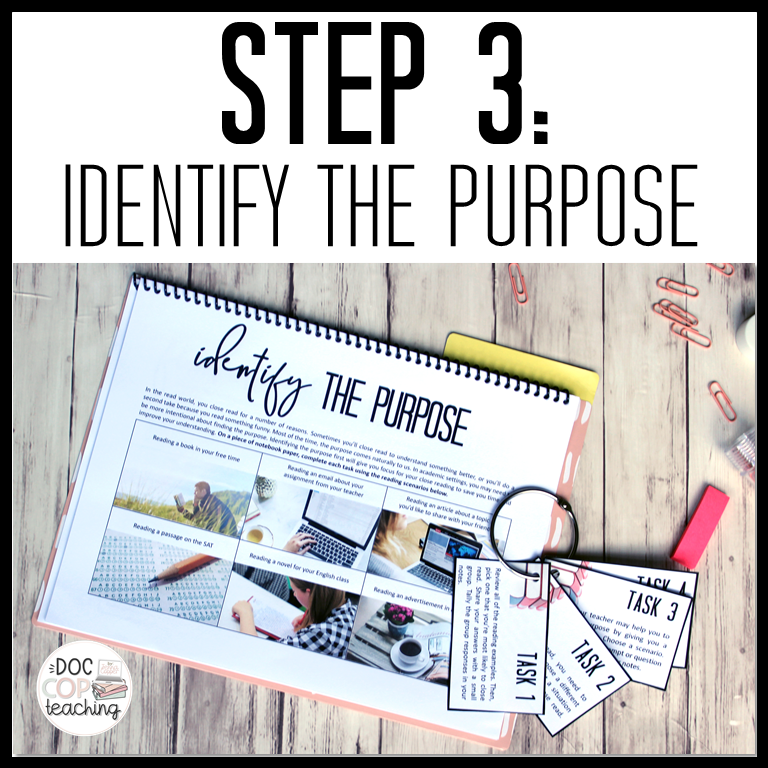 Now that they understand how to focus in on the purpose, it is important to give them active reading tools. Therefore, I give students a completed annotated passage example and a two-column notes example. I found that giving students exemplary examples sets an expectation and provides them with confidence. When I give students these examples, I ask them to write a close reading paragraph or essay. 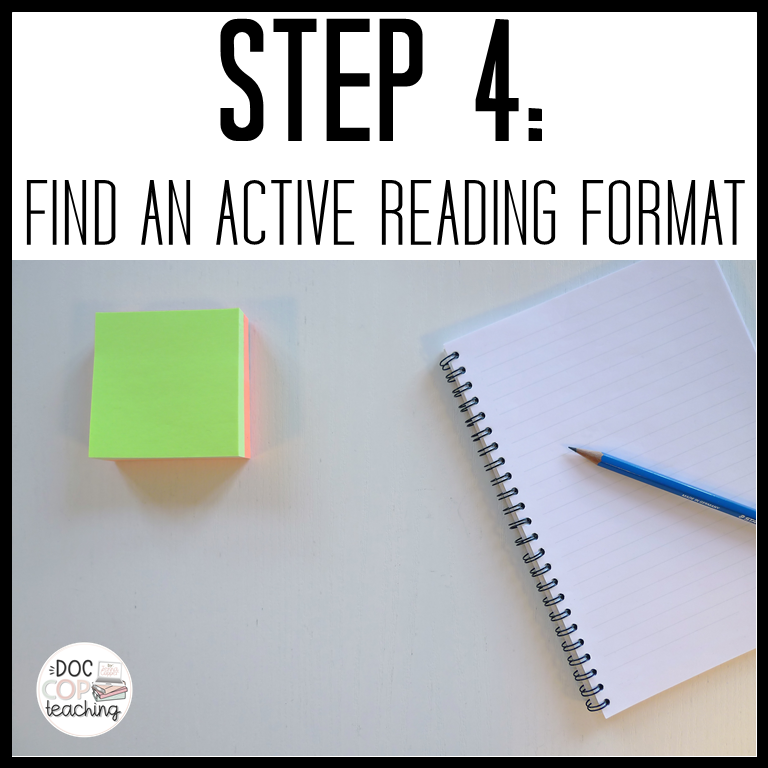 This helps them connect the benefit of active reading to the goal, forming a cohesive close reading analysis. 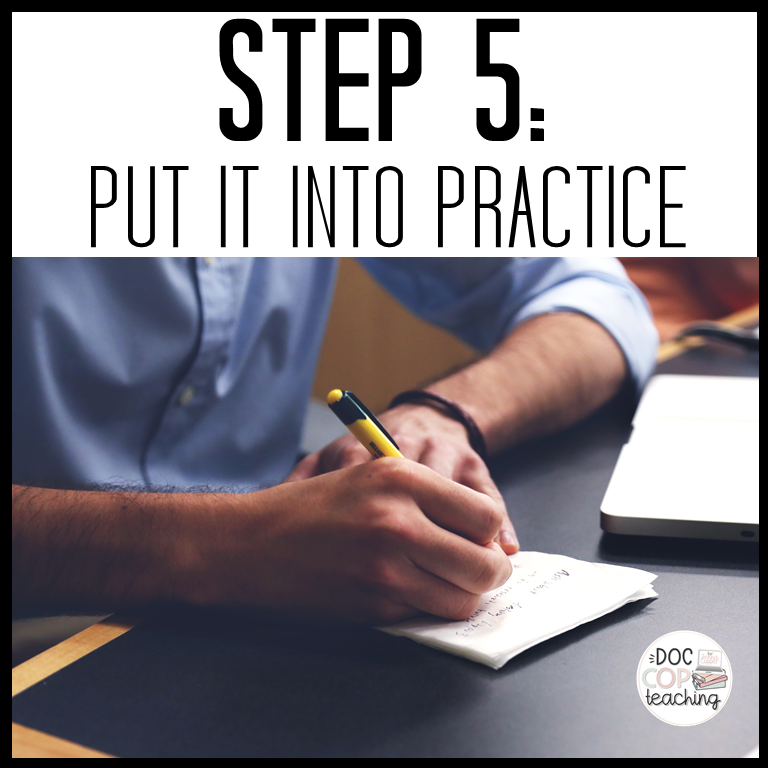 Step five is to give students an opportunity to put all of this into practice. I am a firm believer in giving students choice. Therefore, I give them a passage and ask them to close read with any strategy they choose. Not only does this give them ownership, but it also provides valuable information for me. Now, I can see where they are excelling and struggling. After the final close reading assignment, I conference with individual students, if necessary, or I address specific topics and issues with the class. If my students need a little more guidance, I provide them with guided reading questions to support their focus as they read or an annotation guide to practice annotation further.